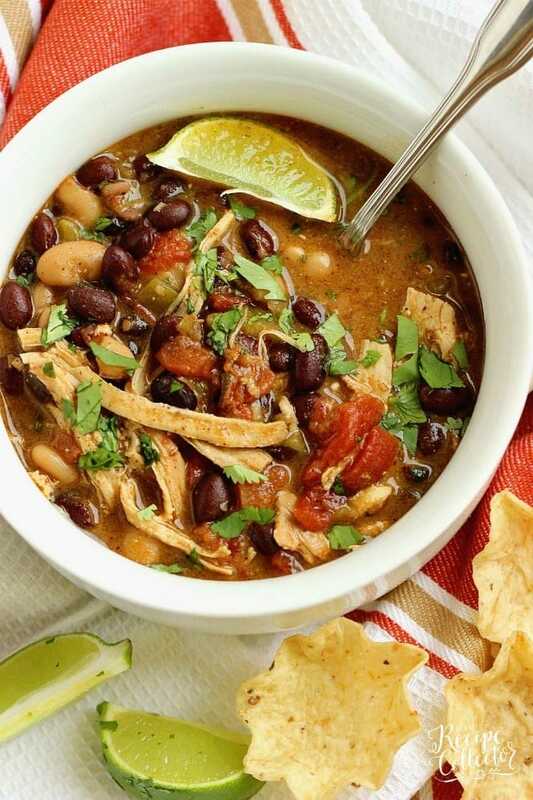 Instant Pot Green Chile Chicken Soup – A quick, easy, and delicious soup recipe filled with beans, green chiles, a little cream cheese, diced tomatoes, and spices. It’s a great weeknight dinner idea and makes several lunches for the week! 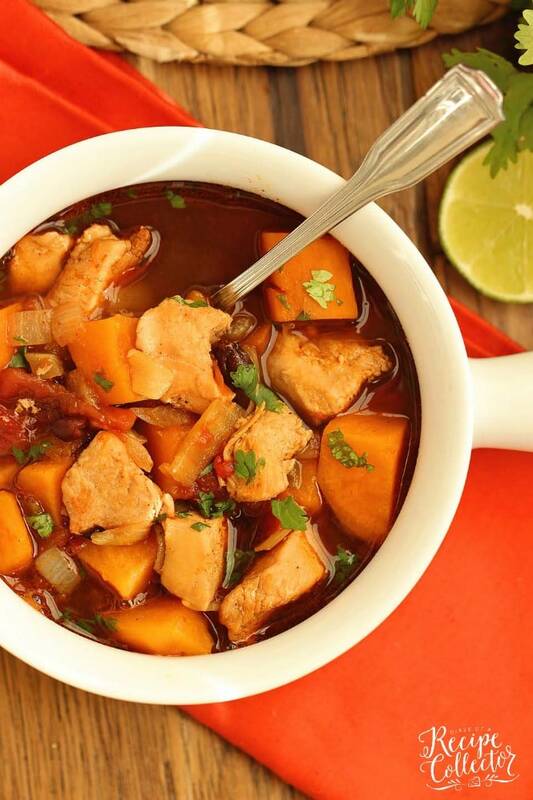 I consider soups for lunch a key to weight loss success. I’m so obsessed with this that I spread my philosophy to my coworkers and several of them became obsessed with soup for lunch too. This Instant Pot Green Chile Chicken Soup is one I can’t wait to share with them for this school year!! And this one is 4 Freestyle Weight Watchers points. 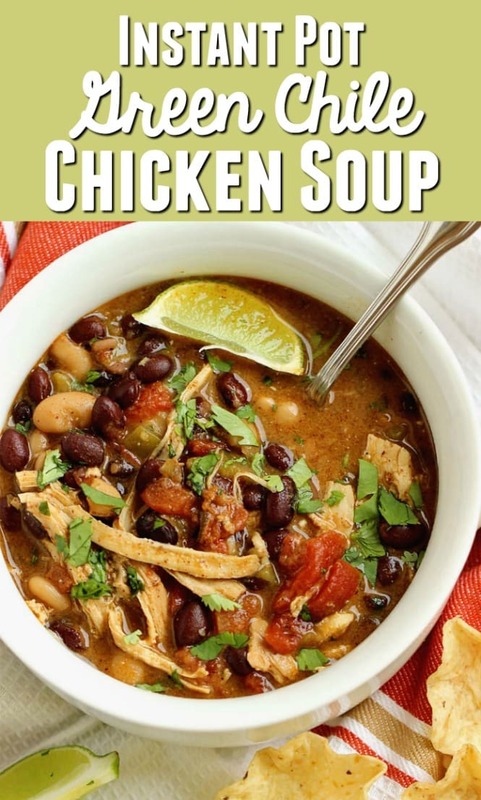 Now of course, this can be made on the stove top similar to my White Bean Chicken Soup (LOVE IT) and Mexican Chicken, Black Bean, & Sweet Potato Soup (also LOVE IT). But this Instant Pot is seriously a game changer folks. I’ve gotten some appliances in my life, but this one is my FAVORITE! There are those appliances that sit in the cabinet majority of the time…looking at you food processor, and then there are little gems like this Instant Pot. I haven’t even begun to scratch the surface at its uses either. I have a whole Pinterest board devoted to its uses. What I’m sure about is that this thing takes easy to the next level! 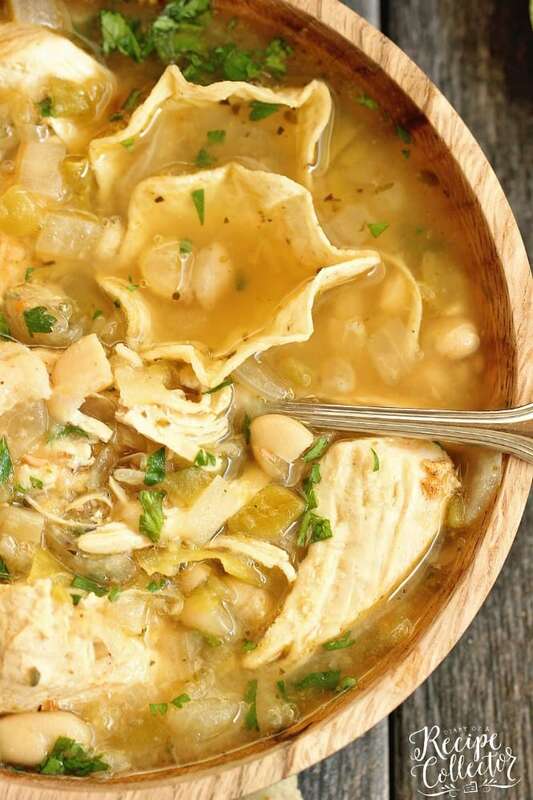 Why is this Instant Pot Green Chile Chicken Soup so easy? First, you put all the soup ingredients in the pot. Set it and forget it. Go do laundry (uggg) or go watch some Netflix (much better). Dinner is done. No stirring, no making sure it doesn’t boil over, or stick to the bottom of the pot. IT’S SO EASY FOLKS! You can use frozen chicken breasts!! Just increase the manual cooking time to 20 minutes. Want this recipe lighter? Omit the cream cheese. Just add a little shredded cheese as a topping if you’d like. This will drop it down to 1 FREESTYLE POINT! Fresh lime juice and fresh cilantro bring this soup to a whole other level! 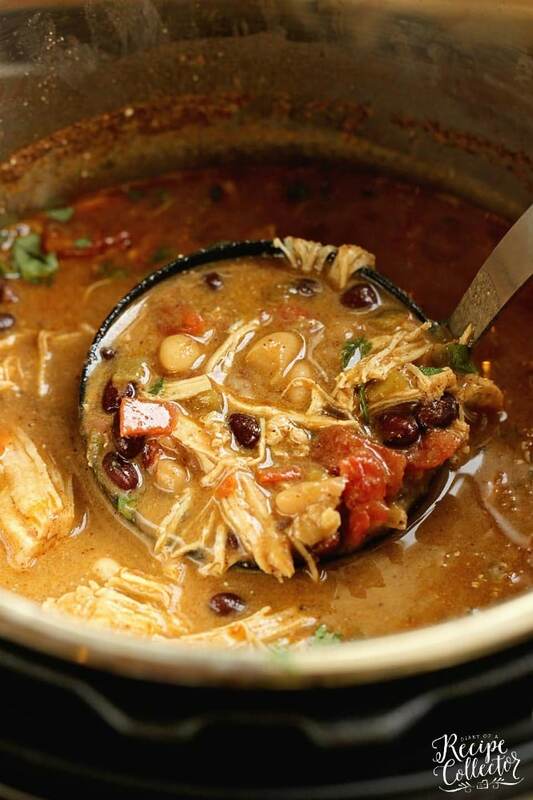 Instant Pot Green Chile Chicken Soup - A quick, easy, and delicious soup recipe filled with beans, green chiles, a little cream cheese, diced tomatoes, and spices. It's a great weeknight dinner idea and makes several lunches for the week! 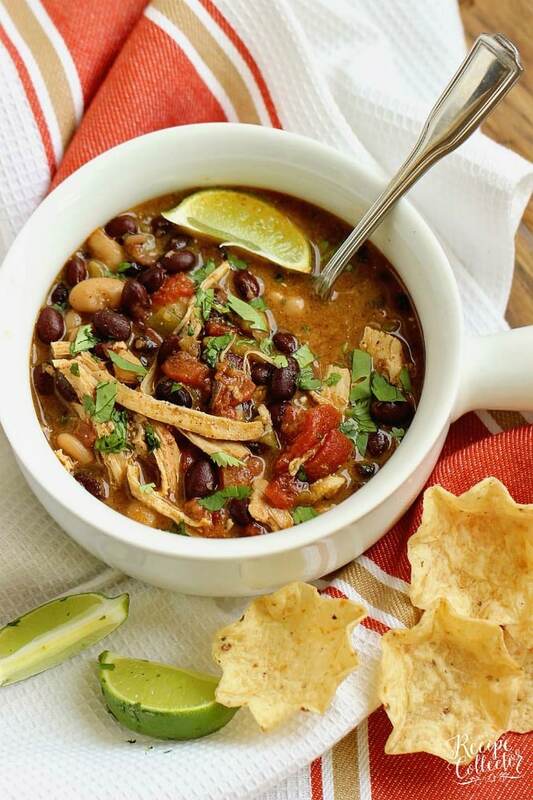 Place all ingredients in Instant Pot except for lime and toppings. Place lid and lock it and make sure valve is set to sealing. Cook on Manual for 15 minutes and let it naturally release for 5 minutes. Then turn the seal valve to do a quick release. Ladle warm soup into serving bowls and top with cilantro and fresh lime juice. Serve with chips. *Add a little shredded cheese if you like. 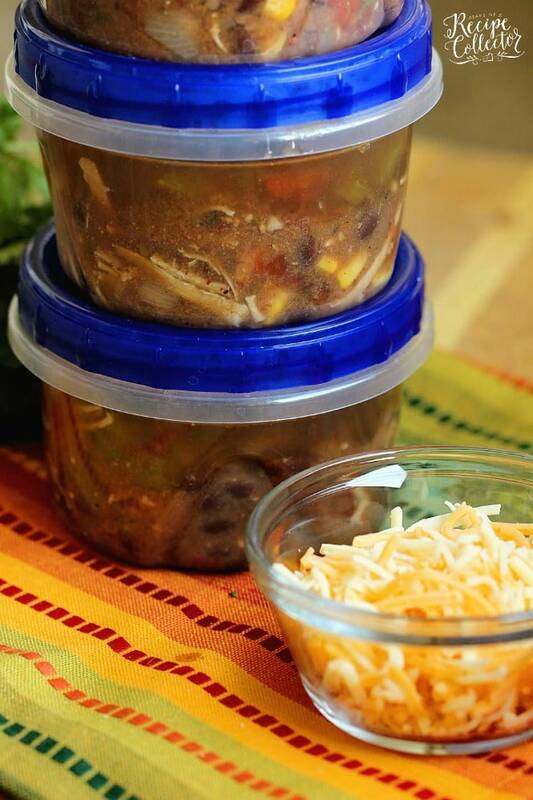 I make a whole batch of soup on Sunday afternoon and divide them up into containers like these. I stick some in the freezer and leave some out for the week. It’s so easy to grab one out of the fridge or freezer in the morning. I usually keep some chips, and shredded cheese at work. I like to add the lime juice and cilantro to the containers before refrigerating them. This looks so delicious! Definitely need to try soon! This recipe is just so so amazing! Thank you for sharing. I’m always looking for instant pot recipes! Definitely going to try this one! I make the White Bean Chicken Soup all the time. It’s a favorite in our house. Hi Jackie! 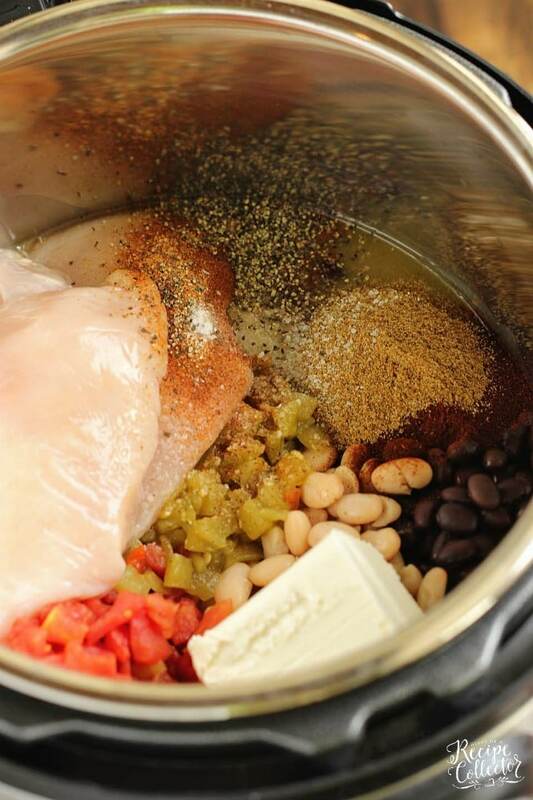 So glad to hear you like the White Bean recipe! It’s my favorite too! But this one was right up there with it! Thanks for visiting! Fantastic soup! Made it tonight for supper while snowed in. I thankfully had almost everything on hand (except the cream cheese). I gave the fam the option of sour cream instead and we added diced avocado. All of us agreed this will definitely go into our rotation. It has just enough spice to make you notice without setting your mouth on fire. Thanks!! So glad y’all liked it Lisa! Thanks for visiting and stay warm! Made this tonight and really enjoyed it. I did use 5 more ounces of enchilada sauce because the can I bought was 15 ounces. I am so glad you liked it! Thanks for visiting!